Summary: PERC (passivated emitter rear cell) technology can significantly increase average cell conversion output efficiency while lowering cost per watt. The design requires high performance dielectric passivation due to its role in reducing electron recombination. Paste manufactures need to formulate products for maximum protection of the dielectric layer during metallization. Heraeus developed its SOL326 silver back-side tabbing pastes focused on these requirements. Judges Comment: The SOL326 series contains new glass chemistry for a greater degree of controlled reaction between the silver paste and the PERC dielectric layer. In addition to meeting all requirements, excellent solderability and higher adhesion benefit both manufacturers and end-use customers. Summary: Centrotherm offers a one-step PECVD aluminum oxide (AlOx/SiNx) process upgrade for advanced solar cells including PERC mono- and multi-crystalline designs. The Centrotherm AlOx process delivers its best passivation properties at thickness < 20 nm as well as on uneven surfaces; it provides low surface recombination velocity on p-type wafer surfaces. The Centrotherm process provides superior dielectric AlOx/SiNx stacks with excellent passivation properties. Judges Comment: Stacks are deposited in one run by just changing the recipe. This is an advantage compared to ALD systems where only one AlOx layer is deposited at a time and the capping layer needs to be added in another system; it is a fast and straight-forward way to begin PERC manufacturing. 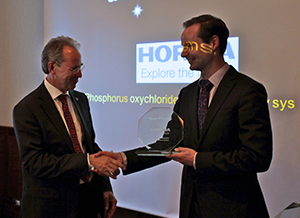 Summary: Horiba has developed a phosphorus oxychloride (POCl3) bulk refill system that replaces legacy smaller containers with larger vessels to reduce downtime for tank exchanges by up to 90 percent/year. This significantly reduces operator exposure risks as well as production downtime. The Horiba approach is also designed to operate at ground level, unlike other overhead systems. 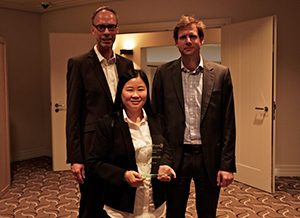 Judges Comment: Horiba’s innovation can benefit operators in terms of downtime, safety and waste containment. The company also offers a robust PFA bubbler vessel to replace the relatively fragile quartz bubblers found in other systems. Summary: Battery storage systems rely on data communications and logging for monitoring performance, maintenance and operations. Steca offers its Stecalink bus with an RS485 communications interface that allows a charge controller to act as a communications master, collecting relevant data from other controllers or sensors. It can also calculate a battery’s charge state and can even support non-Steca products. 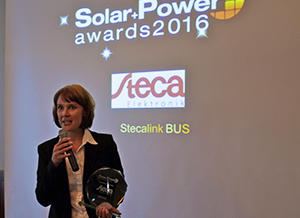 Judges Comment: The communications abilities of the Stecalink bus make it one of the most versatile product solutions of its type. Enabling intercommunication between various products helps ensure optimized system management and longer lifetimes. Summary: Utility-scale / commercial PV plants have demanding requirements for climatological monitoring. Greater irradiance data and analysis accuracy enables power plants to be optimised for maximum performance, yield and reliability. 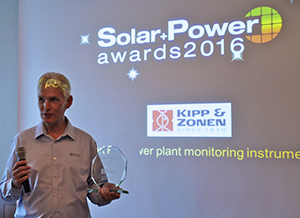 Kipp & Zonen’ smart instruments comprise a full range of solar radiation measurement solutions. Judges Comment: Kipp & Zonen has combined the research-grade CMP21 and CMP22 pyranometers with smart features to provide improved performance in its new SMP21 and SMP22 models that have been optimised for even greater accuracy and reliability. Summary: The PVGuard supervision software platform monitors and controls photovoltaic plants in real-time while it optimizes operations centre processes and reporting. Proprietary PVGuard software pinpoints aspects of plant performance that are not optimal and makes specific, actionable recommendations to improve results. The company’s ADvise web portal makes accessing information, performance modelling and variance analysis easy. Judges comment: The PVGaurd® system is designed for owners who manage their own maintenance and operational programs as well as those with a larger portfolio of properties. Utilizing the programs full range of benefits is like having a consultant on staff 24/7. Summary: Meyer Burger has succeeded in pushing total thickness variation (TTV) to below 10 µm in slicing silicon wafers from standard bricks. This boost in productivity is thanks to optimized geometry and narrow wire guide roller axis combined with specially developed cutting processes. 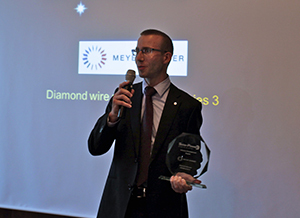 Judges Comment: Meyer Burger reduced the wire diameter in its new generation of diamond wire saws while increasing cutting speed – a significant accomplishment given the exacting demands of high volume solar cell manufacturing. 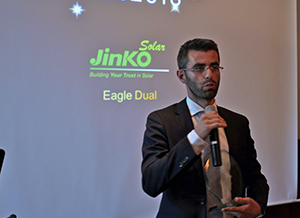 Summary: Jinko Solar’s new dual glass module provides heavy-duty robustness and durability for regions with extreme environments such as high temperatures, humidity, strong winds and heavy snow. It can be widely used in universal installations including water floats, desert utilities, residential and commercial applications. Judges Comment: The new dual glass module incorporates a strengthened frame with a heat-strengthened back sheet glass layer that increases its resistance to micro-cracking, thus lowering the risk of ‘snail-track’ generation as well as potential induced degradation (PID), light induced degradation (LID), and corrosion. Summary: Azuri Technologies' HomeSmart is the first use of intelligent automation in small solar home systems. HomeSmart is designed to provide light each night even after cloudy daytime conditions. HomeSmart can effectively eliminate ‘solar range anxiety’—the fear of running out of power during non-generating periods. 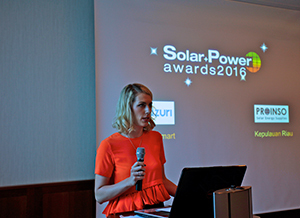 Judges Comment: Azuri's Quad solar home system with HomeSmart power management is provided on a pay-as-you-go basis. It not only brings a new level of quality and intelligence to the rural off-grid market, it also costs a household less than the kerosene and phone charging fees that it is designed to replace. Judges Comment: Off-grid solar is the best, most practical electrification option for much of the world’s rural population. About 37 percent of those without electricity live in South and Southeast Asia. 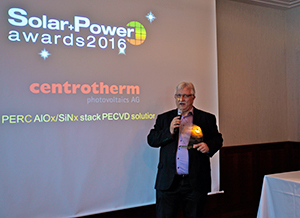 Proinso’s standalone photovoltaic systems exemplify what solar can achieve. The PV plant in Indonesia’s Kepulauan Riau supplies residents with enough energy to power essential LED lights, small appliances and street lighting; it enhances safety and enriches daily life in ways previously impossible. 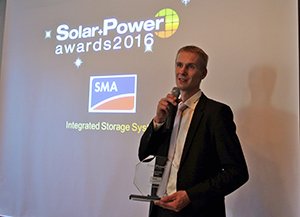 Summary: The SMA Integrated Storage System is a simple way to integrate battery storage into a new solar PV system. With Smart Energy's Sunny Boy built-in battery, no technical knowledge is necessary to store generated power for use during nigh time or other non-generating periods. Judges Comment: SMA's system monitors how much energy is being generated, consumed, and whether there is excess fed into the grid. This information enables the SMA Home Manager to intelligently instruct the system to store PV generated power in batteries or alternatively shunt power to SMA radio controlled sockets. Summary: The German juwi group has one big goal: 100 percent of renewable energies worldwide. Its mission: Work together to implement renewable energies economically and reliably with passion. Summary: The Solar Impulse is a Swiss long-range experimental solar powered aircraft at the center of an attempt by the foundation to circumnavigate the world in a piloted fixed-wing aircraft using only solar power. The goal of the project is to bring attention to clean technologies, especially photovoltaic power, and the optimisation of energy efficiency technologies. 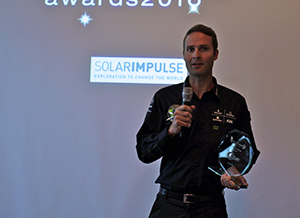 Judges Comment: The accomplishments of the Impulse Foundation and its crew of engineers, pilots and the entire organisation has created more awareness and support for clean energy as a practical source of electric power that can even be used to fly an aircraft across transcontinental routes. 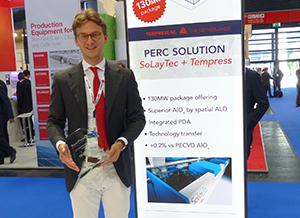 Summary: Tempress (an Amtech subsidiary) created a new process to increase throughput without the drawbacks (high cost/high maintenance) of complex low pressure systems. The HDPOCl3 platform enables emitter formation at around 35 percent lower cost per-watt compared to conventional atmospheric POCl3 systems. Judges Comment: the drive to higher cell conversion efficiencies places increasingly more strict process control requirements on the POCl3 process, notably emitter resistivities, lower surface concentrations, and better uniformities, while seeking cost per-watt reductions and higher throughput. The new Tempress process delivers while keeping watch on overhead costs.